Holly has a strong and developing practice in all areas of criminal law. She is a CPS Level Two Prosecutor and regularly appears in Crown Court hearings, appeals and trials. She is available to accept publicly and privately funded instructions in all areas of criminal law for both the prosecution and the defence. Holly has been instructed on numerous Crown Court trials, both prosecuting and defending, across a wide spectrum of criminal law including burglary, robbery, violent offences, drugs offences and offences involving weapons. She has experience of cases involving the Proceeds of Crime Act 2002 and complex areas of law including cases brought under the Vehicle Excise & Registration Act 1994 and other areas focusing on complex statute and regulations. Alongside her busy Crown Court practice, Holly also continues to accept instructions in the Magistrates’ Court. She has conducted numerous trials and hearings in the Magistrates’ and Youth Courts, including serious assaults, driving offences, sexual offences, multi-handed cases and domestic violence cases. Holly adopts a clear and robust approach in court and is adept at looking ahead in any case in order to plan for a range of eventualities. She is known for her calm and approachable manner when dealing with clients and witnesses. She has experience dealing with vulnerable clients and witnesses and has completed the Vulnerable Witness Advocacy Training course, which focuses on training for Ground Rules Hearings, child witnesses and cases that fall within the Section 28 pilot scheme (video-recorded cross-examination). R v Hutchinson– Teesside Crown Court- 4 day trial involving Assault Occasioning Actual Bodily Harm on a Prison officer by a prisoner serving a sentence of Imprisonment for Public Protection. R v Smith– Leeds Crown Court- 2 day Attempt Burglary trial involving various written and oral legal arguments on admissibility of evidence and PACE breaches. R v Norman– York Crown Court- multi-handed affray- Holly requested enhanced CCTV footage of the offence, which was ultimately consistent with the Defendant’s basis of plea. This avoided the need for a Newton Hearing on whether or not the Defendant was the main aggressor and resulted in the Defendant receiving a community order with an unpaid work requirement. R v HUSSAIN– Leeds Crown Court- successfully overturned an appeal against conviction on a domestic violence matter in which the defendant was originally sentenced to custody. R v West– Leeds Magistrates’ Court- successfully defended a vulnerable adult accused of assaulting a woman and her daughter. Holly Clegg is a C-List Specialist Regulatory Advocate. Holly has a growing practice in all Regulatory and Public Law matters and has wide-ranging experience in this area. She has acted in numerous cases involving prosecutions brought by private agencies including local councils, the Environment Agency, HSE, RSPCA, DVLA, HMRC and FSA. She has experience of dealing with complicated regulations, factual issues and cross-examining expert witnesses. She has been accepted on the panel for the Government Legal Department as a Junior Junior and receives regular instructions from them in relation to cases involving Prison Law and Employment issues. 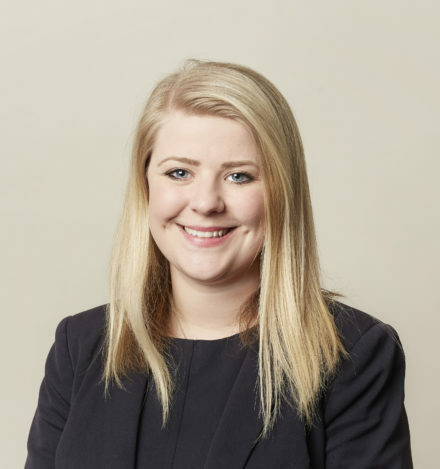 Prior to pupillage Holly worked as a Paralegal at Stewarts Law, a firm specialising in high value cases involving catastrophic injuries and fatal accidents. During her time as a paralegal Holly assisted with the preparation of numerous cases involving the HSE and the Care Quality Commission. Holly has prosecuted on behalf of the Home Office, the Police and the HMRC in both the Magistrates’ Court and the Crown Court. She has successfully prosecuted a number of appeals to the Crown Court on behalf of the DVLA, involving complex legal submissions on how excise penalties and back duty are calculated under the Vehicle Excise & Registration Act 1994. Holly has undertaken secondments with South Yorkshire Police and the Clinical Commissioning Group in York. She has delivered training to West Yorkshire Fire Brigade. Holly has also represented numerous clients at Mental Health Tribunals and is experienced when dealing with vulnerable clients. Holly has a keen interest in inquest work and coronial law. She is looking to develop her experience in this area, working closely with other members of the inquest team within Chambers. Due to her experience of Criminal, Regulatory and Civil law, Holly is able to offer continuity in cases that may involve a number of legal areas and disciplines. FSA v Hussein– The Bowood Farms Slaughterhouse cruelty case- Holly Defended one of the slaughtermen on an offence of animal cruelty. R (Calderdale Council) v Ramsden– represented a Defendant facing charges brought under the Transmissible Spongiform Encephalopathies (England) Regulations 2010 and The Pigs (Records, Identification and Movement) Order 2011. Holly has conducted numerous civil hearings in the County Court on a wide variety of trials, applications, hearings and small claims, including cases involving complex issues on credit hire. She also regularly accepts instructions to draft advices and pleadings on personal injury matters for both Claimants and Defendants. Holly has also been instructed to represent clients at civil committal hearings as well as numerous mental health tribunals and appeal hearings and is experienced when dealing with vulnerable clients. She has also conducted trials involving advanced legal submissions and complex areas of law. Prior to pupillage Holly worked as a Paralegal at Stewarts Law, a firm specialising in high value cases involving catastrophic injuries and fatal accidents. During her time as a paralegal Holly assisted with the preparation and litigation of complex cases, regularly participating in conferences about sensitive issues with vulnerable clients and their families. Holly is happy to accept instructions in all areas of civil litigation including the drafting of pleadings and advice. Holly Clegg discusses the matter of an application by Theresa Jordan for leave to apply for judicial review.